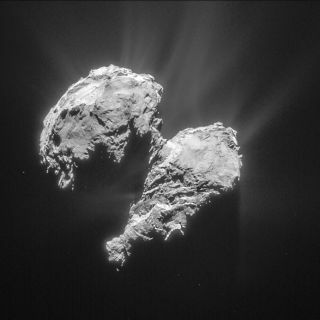 What would it be like to live on a comet? This image shows Comet 67P/Churyumov-Gerasimenko as seen by Europe's Rosetta spacecraft on March 22, 2015. Though ancient cultures often saw comets as harbingers of doom, the cosmic "dirty snowballs" are now viewed as important objects that could help scientists learn more about the early evolution of the solar system. In November 2014, the European Space Agency's Philae probe was dropped from the Rosetta spacecraft, becoming the first human-made spacecraft to soft-land on the surface of a comet. Sending a probe to a comet is one thing. But if astronauts were to land on a comet, what would they experience while living there? Halley's Comet, a dusty ball of ice and frozen gases, spends most of its time in the chilly outland of the solar system. See what it would be like for an astronaut on Comet Halley. For instance, in 1986, Europe's Giotto spacecraft flew into the coma — the large, diffuse cloud of gas and dust around a comet's core, or nucleus — of Halley's Comet to capture the first images of a comet's nucleus. In 2004, NASA's Stardust spacecraft collected dust samples from the coma of the Comet Wild 2. And in 2005, the Deep Impact collider smashed into the Comet Temple 1 to study the guts of the comet's nucleus. Photographs from comet missions have revealed that comet nuclei are quite small, ranging from less than a mile to tens of miles across. Some of them also have irregular shapes, sometimes resembling the end of a dumbbell. "The reason they are so irregular is because their gravity is so low," said Althea Moorhead, a researcher with the Meteoroid Environments Office at NASA's Marshall Space Flight Center. "I think it would be strange to live on a comet for that reason." On Earth and other spherical bodies, gravity is directed straight down. But if you were on a dumbbell-shaped comet, gravity might pull you down and to the side, depending on where you were standing, Moorhead told Space.com. Halley's Comet last visited the inner solar system in 1986 (this image is from March 14 of that year) and will return in 2061. The comet's gravity is so low, it would take two minutes for an object to fall after being dropped from chest height. However, that gravitational tug wouldn't be overwhelmingly strong. The gravity of Halley's Comet, for example, is about equal to the gravity of Mount Everest if you were to remove the mountain from Earth and deposit it in space — if you were to drop an object from chest level, it would take about two minutes to hit the ground. "Its gravity is so low that if you can jump 8 inches [20 centimeters] on Earth, you could jump off Halley's Comet," Moorhead said, adding that you'd want to be very careful with your physical activities. Comets, particularly the irregularly shaped ones, could offer up interesting features to explore, such as impact craters or cavities formed from the sublimation of material. But you'd likely get bored rather quickly. "For something like Halley's Comet, the total surface area is the same as the island of Lanai [in Hawaii]," Moorhead said. Lanai is about 140.5 square miles (364 square kilometers). Comets are best known for their comas, but these features exist only when the comets are relatively close to Earth. Halley's Comet, for example, has a coma for only about a year of its 76-year-long orbit around the sun. If you were on a comet when it had a coma, the cloud would likely obscure the stars. And during the day (a full day on Halley's Comet is between 2.2 and 7.4 Earth days), your field of view would be filled with diffuse light, similar to what you'd see when standing in a deep fog, Moorhead said. When the Giotto spacecraft visited Halley's Comet in 1986, the comet was 0.9 AU from the sun and had a surface temperature of about 170 degrees Fahrenheit (77 degrees Celsius). Rosetta, on the other hand, measured a temperature for Philae's comet, 67P/C-G, of minus 94 F (minus 70 C) in July 2014, when the comet was more than 3 AU (about 279 million miles, or 450 million km) from the sun. These elongated orbits also mean that the amount of time it would take to call home to Earth would vary greatly, from a few minutes to several hours.